Now I want it to be more user friendly - as field state is returned back from the server my field keeps glowing red until next submit with valid input is initiated. 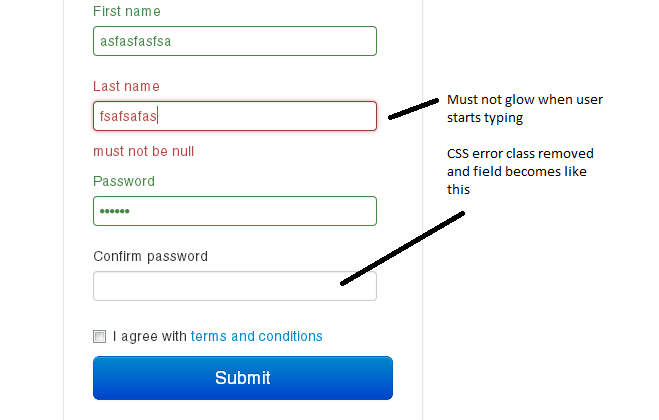 Therefore after user submitted form, received some fields - some in valid, some in invalid state I want field to be neutral decoration whenever user starts typing inside. to trigger event for any input field with class .input-xlarge whenever user starts typing. Indicate which input field exactly requires changing of css decoration(removing css classes) to neutral white. Unfortunately I can't seem to extract the actual input element which triggered .keyup event. Is it possible to do this? Also, don't be affraid to use console.log(). Using it in the case would have show you that element was an event. This question already has an answer here: How do I call a specific Java method on click/submit event of specific button in JSP? 3 answers I have two jsp pages both consisting of forms. One is a "signup.jsp" page the other "login.jsp".